Red dwarfs, also known as M stars, are dim compared to stars like our sun and are just 10 to 20 percent as massive. They make up roughly three-quarters of the stars in the galaxy, and recently scientists found red dwarfs are far more common than before thought, making up at least 80 percent of the total number of stars. The fact that red dwarfs are so very common has made astrobiologists wonder if they might be the best chance for discovering planets habitable to life as we know it. More and more planets are getting discovered around red dwarfs — for instance, a potentially habitable "super-Earth" at least 4.5 times the mass of Earth, GJ 667Cb, was recently found orbiting the red dwarf GJ 667C. "More of these planets are being found, so research is moving from being theoretical and predictive to using actual data from extrasolar planets," said researcher Manoj Joshi, an atmospheric physicist at the University of East Anglia in England. Orbit of Mercury relative to other planets in our solar system. However, being too close to a star can have its disadvantages. For instance, the gravitational pull of the star would cause tides that could wreak havoc on such a world, perhaps leading to a so-called "tidal Venus" scenario where it loses all of its surface water. Also, young red dwarfs less than 3 billion years old may be very active, firing off flares several times per day, causing ultraviolet radiation to jump by 100 to 10,000 times normal levels and potentially sterilizing the surface of a nearby planet or even helping to strip off its atmosphere. "If a rocky planet forms around an M-star and it has water on it, if it gets cold enough, that'll turn to ice or snow," Joshi said. "As for the odds of rocky planets forming around M-stars, Neptune- and sub-Neptune-sized objects have been found, so chances could be good." The scientists found that any such planets encircling red dwarf stars would absorb more of their light than previously thought, leading to significantly warmer surfaces. This means the outer edge of the habitable zone around red dwarfs might be 10 to 30 percent farther away from its parent zone than once suggested. "I was surprised that the effect was as large as it was," Joshi told Astrobiology Magazine. 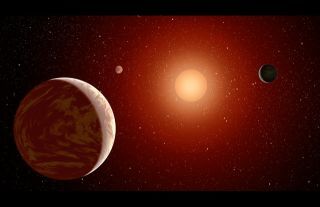 "The zone where liquid water is stable on a planet's surface is farther away from such stars than previously thought." Joshi cautioned they only looked at the effects of water ice and snow, when other kinds might be important when considering how much energy a planet absorbs and reflects, such as frozen carbon dioxide, nitrous oxide and methane. Also, "we didn't look at the effects of atmospheric absorption of radiation by gases such as water vapor or carbon dioxide," he added. "That should be done in future."